“An unusual story will soon be unfurled,” promises the Cat in the Hat as he opens ‘Seussical the Musical.’ It’s the story we all know and love. There are tails that grow so big birds stop being able to fly, people so small you can’t see them and of course, the iconic Cat in the Hat, orchestrating it all. Our story begins with “a think”, when Horton the elephant finds a dust speck with a planet of tiny Whos on it that he vows to protect. After all, “A person’s a person no matter how small.” This is a heart warming story of friendship, non-judgemental kindness and most importantly the resounding power of the imagination. Director James Tobias notes some of the many topics that the narrative discusses: “bullying, unrequited love, body insecurity” which are explored in an accessible and nurturing way. And this musical production of it is an absolute success. The cast is spectacularly strong across the board, a cohesive ensemble who also find their own vivid individualisms. Amy Perry is the perfect Gertrude McFuzz, a one feathered bird with a fantastic voice, she immediately has her audience rooting for her. Scott Paige as Horton the Elephant is equally perfect – charming, kind and gentle. Marc Pickering plays the cat himself, playful and vibrant, flitting chameleon like between characters. Ngozi Ugoh as Sour kangaroo is also a highlight, a vocal powerhouse who shines with charisma. The show is fantastically designed by collaborative team Justin Williams and Jonny Rust, with a clear emphasis on colour. 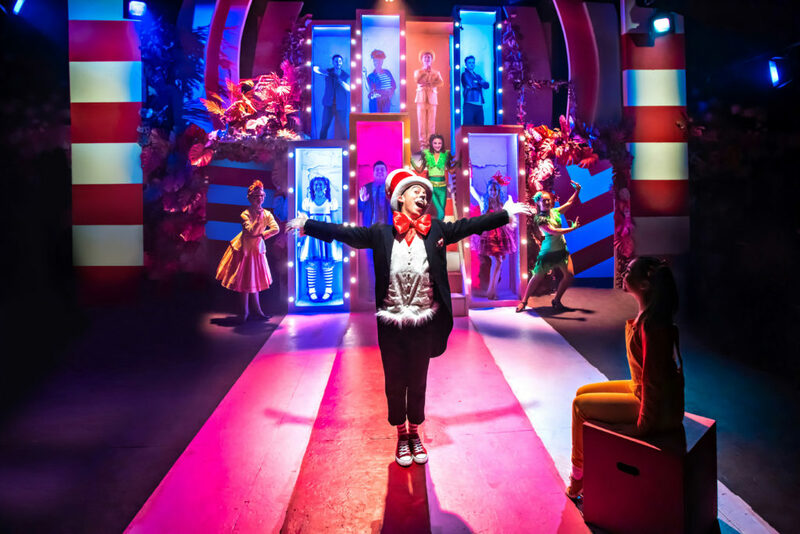 The Whos all wear yellow and orange (costumes by Rachel Cartlidge), the set itself is painted pink, and every last detail has been factored into this aesthetic. The music created by Lynn Ahrens and Stephen Flaherty mimics a range of musical styles, swing, jazz and of course classic musical theatre. I’m still humming some of my favourites today! Between songs though the piece can feel a little thin, and there is little scripting to allow us to get to know these characters when they’re not singing. At moments it feels almost medley like although the talent of the cast carry the production through. Celebrating imagination and kindness, ‘Seussical the Musical’ is a truly joyful production that will delight all ages. Last ten shows reviewed at this venue!